How do we make your bag? 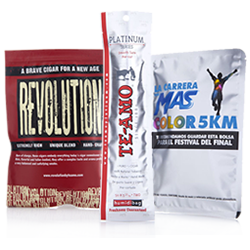 Lamitec is an expert in developing flexible packaging solutions which enable its clients to compete with a high quality barrier package to preserve their products. The function of a package is to protect the product it contains; the unprinted line of Lamitec Bags offers different types of barriers and are available in various models with diverse aesthetic and finishes which are appealing to the final consumer; we have a wide range of models that adapt to your product and budget. 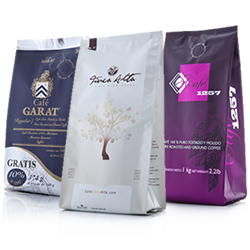 Lamitec has developed and innovated in flexible packaging solutions; it manufactures most of the coffee packages for the Mexican market and many export brands. 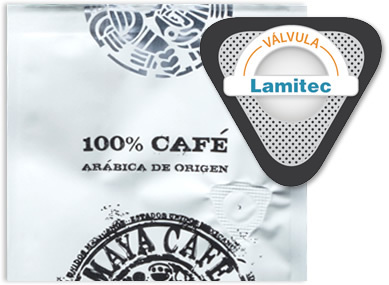 Coffee packages made by Lamitec, comply with strict quality controls, manufactured with FDA approved materials and use advanced accessories such as the Lamitec degassing valve. Several finishes are available to our customers: matt, glossy, matt-glossy to registry, hologram, and many more. 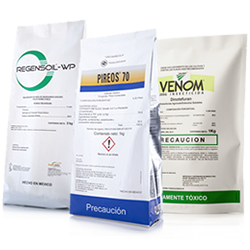 Lamitec Bag solutions for agrochemical packaging have the guarantee to be the best package so that distributors and farmers may be sure that your products are packaged with the quality they are expecting to have. 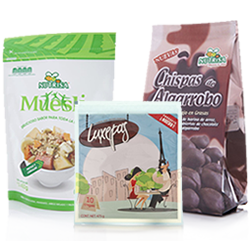 Lamitec Bags are printed with the highest quality and in compliance with the labeling norms for international and Mexican markets. Lamitec Bags satisfy standard for agrochemical packaging such as anti punching, mechanic stress, oxygen, water, and odor and aroma barriers. 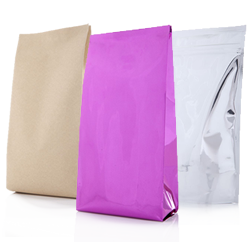 Lamitec Bags and pouches are developed for diverse food packaging such as mole, fish, salmon, tuna, granola, flavorings, colorings, starches, liquids, syrups, tequila, among others. Lamitec uses FDA approved materials and organic inks free of heavy metals which comply with the highest standards of pharmaceutical and food packaging. Lamitec develops customized products always with the same quality and made in minimum production time frames and short delivery deadlines by using innovating technologies. The best coffee is packaged in the best coffee bag of Mexico, a Lamitec bag. The Lamitec valve of our coffee bags releases CO2 and keeps the aroma generated by the recently roasted coffee inside the Lamitec Bag preventing exterior air from flowing in. With this, the coffee preserves its aroma and quality.